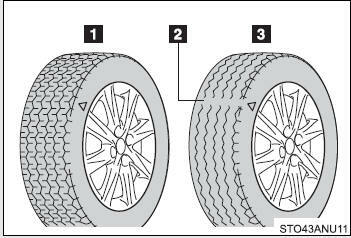 The compact spare tire is not equipped with a tire pressure warning valve and transmitter. 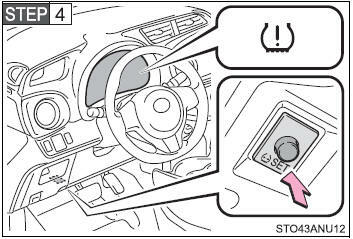 Park the vehicle in a safe place and turn the engine switch to the “LOCK” position. Initialization cannot be performed while the vehicle is moving. Wait for a few minutes with the engine switch in the “ON” position and then turn the engine switch to the “LOCK” position. ●After driving for a certain period of time since the initialization has been completed, the warning light comes on after blinks for 1 minute. Observe the following precautions to prevent accidents. Failure to do so may cause damage to parts of the drive train as well as dangerous handling characteristics, which may lead to an accident resulting in death or serious injury. ●Do not tow if your vehicle has a compact spare tire installed. ●When removing or fitting the wheels, tires or the tire pressure warning valves and transmitters, contact your Toyota dealer as the tire pressure warning valves and transmitters may be damaged if not handled correctly.